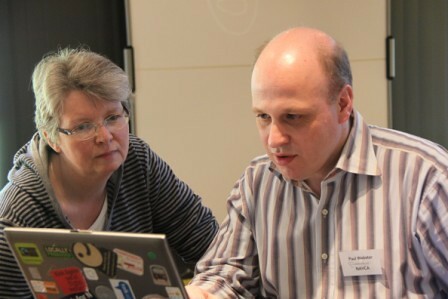 On Thursday Skills For Care launched the first part of their strategy on the digital skills needs of the care sector. This plan is based on results from an on-line and paper based survey conducted in the early part of this year. Further qualitative research and in depth interviews are to follow. There is a Storify summary of the day and the strategy is available to read and download from the Skills for Care website, however some of the headline figures and findings presented by Sara Dunn really stood out for me so I’ve shared them here. Encouragingly over 90% of managers in social care providers reported that their organisations are using digital technologies to support HR & recruitment, in delivery & recording of learning and to support marketing & communications. Where the figures are the most revealing is when the same questions are asked separately of managers and their staff. 78% of managers report that digital technology is used by their organisation to keep in touch with family and friends of residents, however only 48% of staff would report this as true. The method used by staff for accessing the Internet varies and shows that the proliferation of smartphones & tablets maybe out of step with how organisations see Internet access. For example 74% of staff say they use their own smartphone for personal use to access the web with just 14% using an employer supplied device for this purpose. Also 20% of respondents say they have to use their own personal device for work use. The figures for Tablet use show a very similar proportion of own use and employer supplied devices. Compare this with Desktop or Laptop access where 64% use an employer supplied computer (30% laptop) against 10% using their own machine (15% from own laptop). The skills gap varies across disciplines. Rather worryingly 22% of managers say they personally need increased Basic On-line Skills as do 52% of frontline staff! There is also a call for increased Digital Champion skills by 50% of managers and a massive 80% of frontline staff. There is a large gap in the perception by managers of the level of digital skills their staff have against the rating staff would give themselves. 97% of staff say they have good basic on-line skills, but only 48% of managers would agree. 91% of staff say they have on-line security awareness, a view shared by only 40% of managers. We discussed this and wonder if it could be that staff consider themselves to be digitally skilled if they can use a smartphone or tablet to navigate the web, make on-line purchases, access social network sites and manipulate images. This would be against a managers view who would only consider staff to be digitally skilled if they could use mail merge, spreadsheet formulas and other parts of their desktop office software. Echoing the findings of our Connecting Care work, the survey and subsequent discussions highly rated the often self led digital innovations sourced by Activities Co-ordinators in care homes. These unofficial digital champions could lead the way in bringing tablet technology, mobile apps for arts and reminiscence or simply websites like YouTube and Google Streetview into a care setting. There is still a way to go, particularly around addressing the IT and digital infrastructure basic needs of small voluntary sector care providers, but the strategy that this research has produced feels like a very positive start in skills development for staff providing care services.